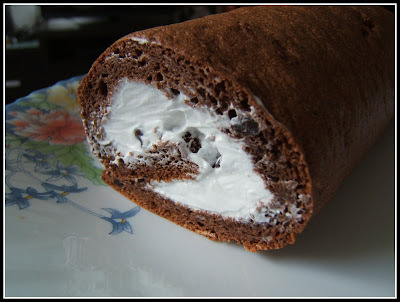 I was almost giving up of making Swiss roll as my previous attempts encountered many problems like serious cracking while rolling, the sponge layer was so dense and etc, etc,. There were times that the base of the cake was so hard (like a slab of rubber) that whole cake need to be discarded. Spent a lot of time, efforts and ingredients ,nevertheless outcome was "zero" . How disappointing! But today, I tried slightly different method and I managed to make it successfully. Thanks HBS for the Swiss roll recipe. Original recipe didn't call for "cream of tartar" however I just add 1/8 tsp in order to make the sponge layer lighter. For the filling , I used some whipped cream and choco chips instead strawberries. In a mixing bowl, beat the egg yolks until smooth and creamy. Add in the flour and cocoa powder (sieved). Mix well till it comes to a thick paste. In a mixer, whisk egg whites until white and frothy. Add remaining sugar and continue to mix until stiff. Add 1/3 of the egg white to the egg yolk mixture and mix till the batter is less dense. Mix the balanced egg whites with number (4). Add the melted butter in and mix well gently using spatula. Pour the batter into (9"x11") baking pan and bake in 180 degree C preheated oven for 15 mins. 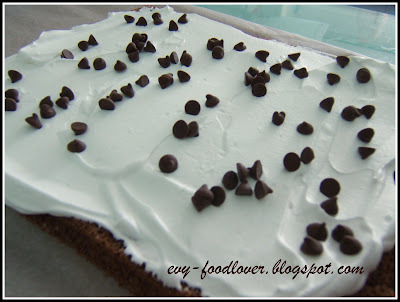 Spread whipped cream (100ml) and sprinkle some choco chips on top. Roll up gently using parchment paper. OH my, those look amazing! I've never actually seen anyone homemake them! Hi All, thanks for your visit and kind words! Really appreciate them!! Hi Camelia, I just added my blog to Petitchef.com. Oh wow look at that swirl! How beautiful! Glad you had success, your Swiss roll looks yummy. ooooh AMAZING! 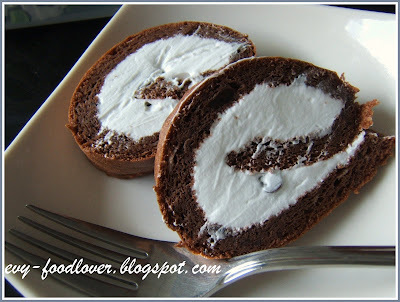 I have never been able to master the swiss roll - but yours looks great! This looks great and quite simple to make... after a few tries! lol! How yummy and wonderful! My 2yo daughter walked up behind me as I was looking about your post. She said, "Oh, YUMMY!!" I think she is correct. 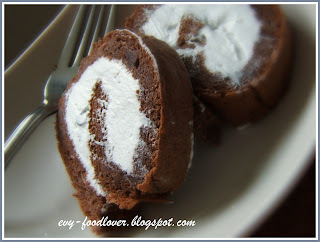 Good job on the chocolate swiss roll. I found your blog via the Foodie Blogroll! Glad I came by, today. Hello Sook, Mimi, Lisa, Kris, Lisa@blessedwithgrace. THANK YOU so much for all your comments, compliments. It really keeps me going! !